Another day without subways and buses in New York City. Because of my somewhat messed up living situation (and nothing to do with the strike) I have been staying at a hotel in Manhattan this week. My walk from 50th & Lexington to where I work is only about 15 minutes. But in that 15 minutes, I saw walkers, bikers, roller bladers, skateboarders and people on scooters. People are making the best of it and taking it all in a New York stride. The fact remains, however, that this is an illegal strike. It is costing New Yorkers and those who commute into New York money (in extra commuting costs and lost wages), time (in extra commuting time) and patience. As Mayor Mike said (quoted on the editorial pages of the New York Post): "It is costing people their jobs. It will cost billions in lost economic activity. It is robbing people of their opportunities to earn a living and provide for their families . . . . It is costing students their opportunity to learn. It will make it harder for our police officers, firefighters and EMS to get where they need to go." You can read excerpts of the Mayor's address here. The union will be fined $1 million a day. 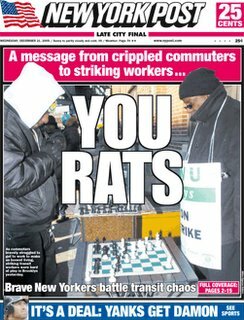 The transit worker will be docked two days pay fro each day they strike. The president of the union, Roger Toussaint, stayed inside all day yesterday, dodging process servers and making no real public statement. Since he has orchestrated this illegal strike, shouldn't the judge toss him in jail for contempt?